The immediate result is that tours of Touro Synagogue, the most historic and probably best known synagogue building in the United States have been canceled. Closing the synagogue is a dramatic step - since it is an important link in Newport's tourism network, and also the flagship Jewish tourist site in the country. Since almost everything about Touro has been elevated into the realm of national symbol, the symbolism of this move is very important. Obviously the current financial situation which has hit all not-for-profits hard is at least partly to blame for the demise of the Foundation. Presumably the Foundation counted on grants and gifts to help cover salaries. There are probably other factors in play, too. The Foundation has been erecting an expensive - but to me somewhat problematic - visitor and interpretive center on a lot adjacent to the synagogue. My guess is that as happens with so many small organizations, the strain of expansion - even though funded primarily by a donor (former Ambassador John Loeb, a descendant of Newport Jews for whom the new Center is to be named) - was too great, especially when the new facility is forcing the organization to reinvent itself. Matters are, of course, complicated by the fact that the synagogue is owned by the historic (Sephardi) Congregation Shearith Israel in New York, and leased for a nominal fee to the active Orthodox Congregation Jeshuat Israel of Newport (which though its members are Ashkenazi, by agreement follows Sephardi ritual). Many other players have gotten involved over the years, most noticeably the U.S. Park Service - playing a role I have never quite understood. The Foundation exists beside the congregation, entrusted to protect and preserve the historic building, and to properly present it to the public. I was impressed with Foundation's program that brought college students to Newport for the summer to serve as guides - I was even looking forward to encouraging some of my own students to apply. But was troubled but what I perceived to be a lack of legitimate historical and social inquiry in what I learned of the program of the new center. Like much of the work on Touro's history over the past century, the presentation as presently made known seems to lean more to the ideological and hagiographic view of Newport. We will have to wait and see what the new center's content is. My requests on behalf of ISJM and this blog for more information last fall went unanswered. I am concerned that even when open there may not be sufficient funds available, for now money will be needed for maintain and staff both synagogue and interpretation center. Will the exhibition be static, or will there be an historian and/or curator at work? Will the Center encourage new research and interpretation (about Rhode Island and New England Jewish history, synagogue architecture, historic preservation, etc.) or will it maintain what the fairly static view of Touro and Newport's Jews which has been fine-tuned since Touro became a National shrine more than a half century ago? In the past there seems to have been a serious disconnect between history taught at Touro and the more wide-ranging work of the Rhode Island Jewish Historical Society. It would a boon to both organizations if George Goodwin or some historian of similar qualification were brought in to link the two. The website of Loeb's organization focuses almost entirely on the earliest history of Newport's Jewish community - and its religious freedom guaranteed by President George Washington in his famous letter to the congregation which stated that the new nation would give "bigotry no sanction." Still, that episode is just one small part of Touro's history, since the original Sephardi community dissolved not long after Washington's pronouncement. It is because Touro's greatest legacy may be its pioneering efforts at historic preservation (the very reason it is called the Touro Synagogue is because of an early endowment made to protect and preserve the empty and unused synagogue by Abraham Touro that the building survives today. More than a half-century before the Anti-Demolition League was formed to save Bevis Marks Synagogue in London, and more than 150 years before the World Monuments Fund started its Jewish Heritage Program, a few early American Jews had the foresight to plan the preservation of Touro. As early as 1822 the Rhode Island American and General Advertiser wrote: We are told that the Jewish Synagogue at Newport is still standing, and with little expense might be long preserved, as a “handsome specimen of ancient architecture." A few months after this notice appeared, Abraham Touro made a bequest of $10,000 to the legislature of the state for “supporting the Jewish Synagogue in the State.” The following year, in the June 1823 session of the General Assembly there is mention of “An Act to Secure and Appropriate the Touro Jewish Synagogue Fund.” Endowing the building, even when it was not in use, protected it. It was in today’s terminology “mothballed,” until it would come into regular use again when Eastern European immigrants reconstituted the Newport Jewish community. Thus began a nearly two century tradition of conserving the historic synagogue, which remains today the oldest standing synagogue buildings in North America. Most recently, the Touro Synagogue Foundation funded and oversaw an extensive restoration of the building that reversed some earlier work, and notably saw the complete restoration by Newman's, Ltd. of Newport of the synagogues many metal light fixtures and other valuable fittings (for a full and exemplary preservation report click here). The new Visitors’ Center will open in 2009, and I hope it tells this story, too. The interest shown by Abraham Touro established a precedent among American Jewish congregations of care and reverence for their synagogue buildings. Still, the vicissitudes of man and nature have caused most of the oldest synagogue buildings in American to be destroyed or demolished (and donors often prefer to build new synagogues than maintain older ones) so Touro remains among American Jewry's most precious possessions. Allen, T.J., 1948. "Touro Synagogue as a National Site," in Touro Synagogue of Congregation Jeshuat Israel. Friends of Touro Synagogue, Newport, R.I.
Goodwin, George M., 2000. “The Politics of Preservation: How Touro Synagogue Became a National Historic Site,” Rhode Island Jewish Historical Notes, 13:2 (Nov 2000), 177-207. Schwartz, Esther I., 1958. “Touro Synagogue Restored, 1827-29,” Journal of the Society of Architectural Historians, XVII (summer 1958), 23-26. Schwartz, Esther I., 1959. “Touro Synagogue Restored,” Rhode Island Jewish Historical Notes, III (Oct 1959), 106-131. Gutstein, Morris A. et al, 1948. Touro Synagogue of Congregation Jesuat Israel, Newport, Rhode Island, Society of Friends of Touro Synagogue National Historic Shrine, Newport. Gutstein, Morris, A., 1958. To Bigotry No Sanction: A Jewish Shrine in America 1658-1958. New York: Bloch Publishing Company. Lewis, Rabbi Dr. Theodore, 1975. "History of Touro Synagogue." Newport History: Bulletin of the Newport Historical Society 48, Part 3, No. 159 (Summer 1975):281-320. Pool, David de Sola, 1948. 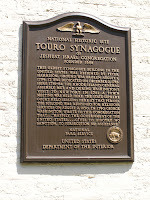 “Some Notes on the Touro Synagogue,” Touro Synagogue of Congregation Jesuat Israel, Newport, Rhode Island, Society of Friends of Touro Synagogue National Historic Shrine, Newport, 7-13. Schless, Nancy Halverson, 1973. “Peter Harrison, The Touro Synagogue, and the Wren City Church,” in Winterthur Portfolio 8 (1973), 187-200. In Bratislava last week I had the pleasure of getting to know Bella Velikovskaia, Executive Director of The Union of Religious Jewish Congregations in the Republic of Belarusand an expert member of the Jewish Heritage Research Group. Bella and her colleagues have one of the hardest jobs in Europe – documenting and protecting Jewish heritage in Belarus. They have made a good start with the documentation –and the results can be seen on the webpage of the Jewish Heritage Research Group, especially in the list of Jewish heritage sites. Protecting and preserving synagogue, former synagogue and cemeteries more difficult. Though some properties have been returned to the Jewish Community, the Jews of Belarus lack the funds to carry out many successful projects to repair, restore and reuse these buildings. Attempts have been made in the past to restore the great synagogue in the western Belarus town of Slonim, and also to find a use for the former Yeshiva building in Volozhin, both of which are important historical, religious and architectural sites. Unfortunately, both projects languish, though although the World Monuments Fund recently awarded a planning grant to all the Volozhin project to be re-addressed and re-formulated. A third pending project is the adaptive restoration of the the former synagogue in Kobrin. This project may have a better chance of succeeding – if funds can be found – since the building could serve again as a synagogue for the many Jewish communities in that part of Belarus who presently have no religious center. To my great regret, I have never been to Belarus During the many years I was associated with the United States Commission for the Preservation of America’s Heritage Abroad as Research Director, I was discouraged from engaging in projects in Belarus because of the frosty relations between the US Government and government of Belarus president Alexander Lukashenko. In this, and in many other ways, the Belarus Jewish community has suffered from being out-of-touch with many foreign institutions, and ineligible for certain kinds of foreign assistance. Besides humanitarian aid from the JDC and some other Jewish charities, there has been little formal support from aboard for Jewish heritage projects. Mostly there have been donations from individuals which are usually directed as specific cemetery care projects. The situation at Kobrin is now urgent, because the government which returned the large 19th-century masonry synagogue to the Jewish community in 2004 threatens to take it back unless restoration work begins. This is a situation that is also becoming common in Poland. After holding Jewish properties for a half century or more and letting them deteriorate into near-ruins, they are returned to communities - but without any financial assistance to restore them. Communities must not only quickly find a use for the building, but also the funds to make them work. Sometimes years pass and nothing happens. Sometimes governments demand quick action. I frequently say the situation is similar to being asked to make soup. On is given the carrots and potatoes, but not pot to cook them in, and sometimes not even a fire. Consequently communities are overburdened. In Belarus, there is a real plan for Kobrin. But there is not enough money. And the government threatens to take the building back if nothing happens soon. 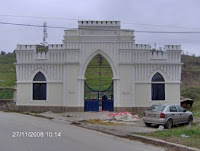 According to Yuri Dorn, Coordinator of Jewish Heritage Research Group in Belarus, the 1868 synagogue building was given to the Jewish community of Kobrin and the Union of Religious Jewish Congregations in the Republic of Belarus in 2004. It had been used for grain storage after the Second World War, and later beer and nonalcoholic beverage production plant in the building prior to 1996. Then the building was given to the local history museum, but the museum lacked funds to start restoration. The synagogue building was left unguarded, and fell into further disrepair. The restoration project was formally announced last September, and since 2004, much has been done to develop a project for the rebuilding and move it forward. - $8,500 was given by a private donor to clean the synagogue and the adjacent territory and to remove of the garbage outside the city. - the grounds have been partially fenced and a watchman hired. The cost of this immediate work amounts to $38,250, money the Jewish community does not have on hand. Estimates for the cost of the total renewal of the building are about a half million dollars (but this depends on the scope of the final project and the world economic situation). Certainly some of this work is needed – the building should be secured against the elements to prevent even worse damage. Some of the work, however, may be premature, since a complete preservation plan and design for reuse has not been completed. The Union of Religious Jewish Congregations in the Republic of Belarus will continue to negotiate with local authorities to gain tie, and to create a situation where scare funs are spent on the most important parts of the project. Meanwhile they are raising money. In a worst case scenario, if the work is not done, they will lose the synagogue forever. JTA columnist Ruth Ellen Gruber (and my esteemed sister) has written about the recent Bratislava seminar (see my previous post). Ruth's advice was important in organizing the seminar, and her extensive experience in almost all the countries represented provided the participants with valuable perspective. Over the past twenty years Ruth has traveled extensively in and written about Jewish heritage in all of the countries participating except Estonia and Belarus. BRATISLAVA, Slovakia (JTA) – The restitution of Jewish communal property in Central and Eastern Europe has been a hot-button issue since the Iron Curtain fell nearly 20 years ago. But often forgotten amid the slow and painful legal battles to get back historic Jewish properties that were seized by the Nazis or nationalized by postwar Communist regimes is the practical and urgent need to care for, conserve and maintain the properties once they’ve been recovered. For two decades and more, I've documented, written about and photographed these sites, which include many yeshivas and synagogues. Many are huge. Many are dilapidated. Some are recognized as historic monuments. Most stand in towns where few, if any, Jews now live. Even basic maintenance can stretch already strapped communal resources. In March, I joined Jewish community representatives from 15 countries who gathered to address these concerns at a seminar held in the Slovak capital, Bratislava. (ISJM) Last week I had the privilege of co-chairing an international seminar in Bratislava devoted to the care, conservation and maintenance of Jewish heritage properties – particularly those which belong to Jewish communities in Central and Eastern Europe. The conference was sponsored by the World Monuments Fund, the Rothschild Foundation (Europe), the Cahnman Foundation and the Joint Distribution Committee (JDC). The organization of the event fell mostly to Maros Borsky of the Slovak Jewish Heritage Center, Herbert Block of the JDC, and to me, representing the International Survey of Jewish Monuments (ISJM). I can’t thank my colleagues enough for all the hard work they did to bring about this successful and important event. Unlike the larger Future of Jewish Heritage in Europe Conference held in Prague in 2004, and sponsored by many of the same foundations, this event was unique in bringing Jewish community representatives responsible for property management of planning and decisions together for the first time. It was not a gathering historians and architects, but of community leaders. To my knowledge it was the first such event for communities devoted solely to Jewish heritage issues. Fittingly, it was held at the Jewish Community Center in Bratislava, hosted by the Bratislava Jewish Community, the members of which were extraordinarily welcoming and helpful to our group. We were thrilled to inaugurate the new meeting hall at the Center (painting was just finished before our arrival), which perfectly suited our needs. The Bratislava Community provided the kosher meals for the entire seminar group and guests (and the Center's chef is great. the food was delicious). Thanks to Bratislava Rabbi Baruch Myers for overseeing kashrut, and also for begin such a welcoming host. I will be writing more about the seminar in the coming weeks, which gathered representatives of Jewish communities in 15 countries, from the Baltic countries to the Balkans, and also included representation from Belarus and Ukraine. An important statement of principals was drafted at the final session of the seminar, and this will be released shortly when a few final changes are made. While to many readers of this blog the statement might seem to reiterate the obvious, as we all know what is obvious in the world of Jewish heritage protection, preservation and presentation is not always what is real. You can read a news brief from the Jewish Telegraphic Agency here. The gathering gave me and the other “experts” and opportunity to exchange information with community representatives, but also to learn the latest in problems and progress regarding Jewish heritage sites in a wide range of political, cultural, religious and economic situations. I will be sharing some of the information on this blog. I also had the occasion to visit before and during the seminar several important preservation projects in the Czech Republic and Slovakia, about which I will report. It was this synagogue that was replaced following a decision to build in 1863. The synagogue is designed in the Moorish style and occupies the location of the previous oratory. Because of the size and cost of the project, work went slowly. Demolition of the earlier building and new construction did not begin until 1874, and the building was completed in 1878. To celebrate the occasion, the Jewish community struck a bronze commemorative medal in the tradition of Italy's Renaissance princes and popes. The tri-partite facade is influenced by synagogues erected in Central Europe in the mid-19th century such as the Templegasse Synagogue in Vienna (1853-58)[ii]Choral Temple in Bucharest (1864-66[iii]), which had a similar arrangement of a higher central bay, and four small turrets. and the The Vercelli facade is only slightly less ornate than Vienna, employing a pattern of white and gray horizontal stripping. This recalls stripping on the Rumbach Street Synagogue in Budapest designed by Otto Wagner (1869-72)[iv] and many other synagogues, but also calls to mind many famous Italian cathedrals such as Orvieto and Siena, as well as scores of other churches built from the Middle Ages to modern times. Inside, however, the style is more traditionally classical in the Italian manner, consisting of a long central nave flanked by aisles separated by arcades carried on columns. These aisles in turn support galleries vaulted by three high barrel vaults set perpendicular to the main nave, recalling the immense arches of the Basilica of Maxentius in the Roman Forum in Rome. The barrel vaults of the central bay help support and buttress a dome that rises on pendentives from the middle of the synagogue nave. The gallery walls are pierced with tall round-headed windows in the end bays, and by large round windows in the central bay under the dome. The facade also has a large round window prominently placed in its center. The nave terminates in a massive apse -- open the full height of the building. Ark and bimah are combined within the apse and raised several steps above the floor level of the rest of the synagogue, reminiscent of the altar arrangement in Roman Catholic churches. Halfway along the nave a large wooden pulpit is wrapped around a supporting pier -- similar to what is found in typical preaching churches throughout Italy. Only the decoration sets the building apart from contemporary Christian structures. It is an odd mix of Classical and Moorish elements, and includes Hebrew inscriptions the length of the nave arcade. As much as the Mole Antonelliana in Turin, the Vercelli synagogue speaks to the (perhaps overblown) aspirations of the emancipated Italian Jewish community. The fact that the synagogue stands silent today, in desperate need of repair, is moving testimony to just how misguided those aspirations were. The Piedmontese Jewish communities had always been small, and with Emancipation came migration and assimilation, reducing them even more. Even without the effect of the Holocaust, it is unlikely that a city like Vercelli (which had a Jewish population of only 275 in 1931) could have maintained a Jewish community large enough to need and strong enough to support a building this size. [i] On Vercelli see T. Sarasso, Storia degli ebrei a Vercelli (Vercelli. ; 1974); D. Colombo, D., "Alcuni appunti sul ghetto di Vercelli," Rassegna mensile di Israel, 42:7-8 (1976), 374-77; R. Bottini Treves, R., Storia del ghetto di Vercelli, Societa storica vercellese, (Vercelli, 1993)and Sacredoti and Tedeschi Falco, op cit., 155-167. On the synagogue see C. Caselli, “Il tempio israelitico di Vercelli dell Comm. G. Locarni,” L’ingegneria civile e le arti industirali XIV (1889), 8-15. [ii] On Vienna’s Tempelgasse synagogue see Krinsky, Synagogues of Europe (Cambridge, MA: MIT Press, 1985), 191-194. [iii] Krinsky, op. cit., 153-154. [iv] Krinsky, op. cit., 159-162. (ISJM) On February 7, 2009,The Philadelphia-based preservation organization Partners for Sacred Places has announced that Society Hill Synagogue, at 418 Spruce Street (between 4th and Lawrence Streets) in Philadelphia, has been awarded an $80,000 matching grant for critical repairs to the envelope of the 19th century sanctuary and annex. The money comes from Partners’ Philadelphia Regional Fund for Sacred Places, established three years ago. This is the Fund’s first grant to a synagogue. Over the course of the next two years, the congregation must raise at least $160,000 in matching funds to complete several restoration projects. The massive granite, brick and stucco synagogue was designed by leading Philadelphia architect Thomas U. Walter (1804-1887) in 1829 as the Spruce Street Baptist Church, of which he was a member. In 1851, the church was enlarged and a new façade with an imposing attic story, was also designed by Walter. Originally there were cupolas over the side bays of the façade, which project slightly like towers, so the overall appearance of the building was loftier and less bulky. The Baptist Church left the building in 1908, when the area had become Philadelphia’s teeming Jewish immigrant neighborhood (my own grandfather was born just a few blocks away at 4th and Bainbridge). By 1910 the building was sold to a Romanian Jewish congregation, Beth Hamedrash Hagadol Nusach Ashkenaz. The Society Hill Synagogue, a conservative congregation, was formed in 1967 during the early years of the revival, restoration and gentrification of what became known as the Society Hill Neighborhood. From 1968 on the congregation restored the building, including Walter’s façade, under the supervision of several architects Henry J. Magaziner (1968) and Cauffman, Wilkenson & Pepper, architects in association with John Milner (1971 ff.). The building is listed a Philadelphia City Landmark and on the state and National Registers of Historic Places. In 1985, architect James A. Oleg Kruhly designed a new addition and in 2007 planning began for an expansion into the building next door, to add classroom and administrative facilities. In addition to the design of this unintended synagogue, Thomas U. Walter also designed the Egyptian Revival style Crown Street Synagogue in 1845. At that time Walter, who had been a pupil of William Strickland, was already well known as the designer of Philadelphia’s Classical style Girard College (1833-47) and the Egyptian style Moyamensing Debtor’s Prison, among other works. He would later go on to earn national fame as the architect of the dome of the United States Capitol Building in Washington, DC. In past postings I have written about synagogues becoming churches, but early in the 20th century in American cities, the reverse was more likely to be true. Society Hill Synagogue is not the only synagogue in the neighborhood located in an historic church. Kesher Israel Synagogue at Lombard Street between 4th and 5th Streets was built as the First Universalist Church in 1794. It was transformed into a synagogue in the 1890s. Society Hill Synagogue is open to the public weekdays from 10:00 am to 3:00 pm. Best to call in advance (215) 922-6590. Kesher Israel can be visited by appointment. Call (215) 922-1776. Both congregations have regular services. Check for hours.